My life is changed every time I travel to Haiti, but my most recent experience was perhaps the most memorable. When my best friend and travel companion, Cecilia, and I heard that the bus was going to the river for baptisms on that first Sunday, we were extremely excited. Neither of us had had the opportunity to witness or experience an event such as this in Haiti before. We eagerly jumped on the packed, creaky school bus that had holes in the floor and paint chipping off. There were at least 60 kids squished on that bus, and they were all singing in beautiful harmony the entire time. Over and over again, perfect songs of praise and worship and expectation. Even when the old school bus took its last breath and broke down for good half way to the river, the songs did not cease. Even as we all held hands and walked the rest of the way to the water, in the middle of the day in the scorching sun, hands sweaty and feet dirty, the songs did not stop. It was a beautiful experience and an amazing thing to witness. Imperfect, yes. Hot, yes. Overwhelming, yes. Full of dirty water and parasites, probably. Yet, so completely imprinted on our minds, souls, and hearts. On the fourth Sunday, my best friend and I were just finishing up our month long stay in Haiti. It was our final holy day in our most favorite place in the world. We were gathering final thoughts from Orphanage staff so that we had all the material we needed to bring back to the US for more personal and interactive fundraising. An American on staff, Nathan, interrupted our last interview to inform us that the bus was going down to the river for baptisms, and he was told to come and get Cecilia and I. We ran over to the little, used school bus that was doubled in maximum capacity with Haitian children. This was the second time we were lucky enough to experience a baptism ceremony, on the bookends of our trip. In all the ways the first Sunday was imperfect, the last Sunday seemed to fix. The broken-down school bus had been replaced; our hearts and souls had been stretched and transformed: we were simply not the same people as we were a few weeks ago. Instead of the heat of the day in the hottest season of the year, this time we were out on the river at golden hour. Our absolute favorite, most cherished hour of every day. The heat dies down, the mosquitos have yet to make their nightly appearance. The anxieties that come with the dark are held at bay for one last hour, but the weight that comes with living another day has subsided. Golden hour is, by far, the most important hour of the day. 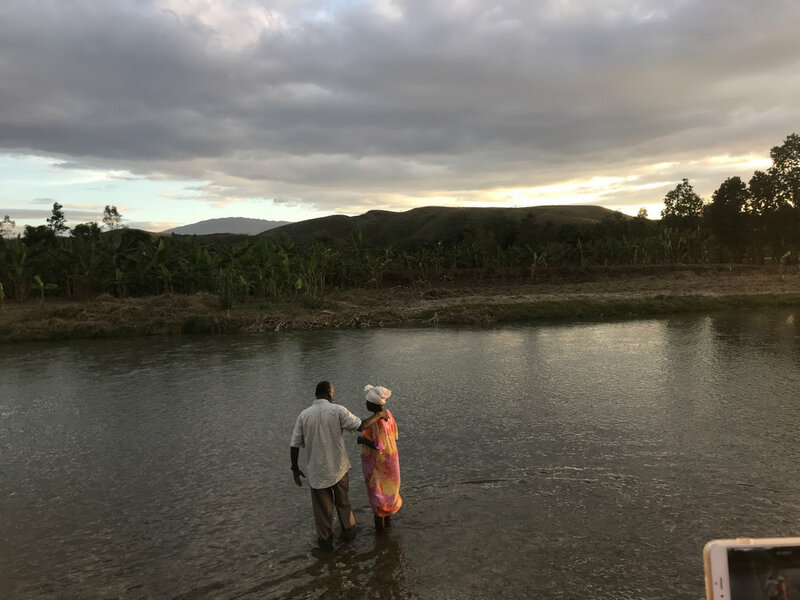 The moments in which I was standing in the river, making the radical decision to be baptized, being prayed over with an audience of at least fifty children, and at last taken aside for my choice to be finalized, are a bit blurry. Up to that second, my whole life in Haiti had been slow, thought out, almost relaxed. But in that moment, everything happened all at once. I had been spending so much time looking at the big picture, but this specific moment seemed to happen before I had the chance to give it a second thought. I remember letting a quick moment of panic slip through me as I let go of Cecilia’s hand and waded out alone towards Pastor Yves. Suddenly I was nodding my head “yes” to all the things I was spiritually committing to and then Pastor Yves dipped me down in the icy cold river water and then it was over, and I was shivering and children were giggling. Then it was Cecilia’s turn, and I know she felt the exact same. As the sun officially tucked itself in behind the green horizon and as the nasty mosquitos began to come out of hiding, we all stuffed ourselves back into the school bus, began to sing praise loudly in unison, and made our way home, cold, wet, sticky, but also brand new. I struggle to put it into words. I was standing in a river with my best friend in Haiti as the golden hour turned into a pink glowing sunset. I was surrounded by the beautiful ti moun (children) I have had the privilege to know and love. And the man praying over me is a man of the most radical faith, wisdom, and discernment I have ever known. It’s crazy just how much God worked me up for this moment. His goodness and faithfulness absolutely blows me away. God’s plan is so good and so intentional and so perfect. I feel so blessed. So incredibly lucky that God chose me to be here and chose me to love these people. How fitting that this is where I outwardly profess my will to follow Jesus—the place I am certain He has called me to. I am so humbled by Jesus and the Holy Spirit within me. The word of God has taken in a full new meaning. I don’t take those words lightly. And at the end of every day, every chapter, I will run, swimming through the water, jumping off the boat, thrashing towards Jesus. That is what the baptism meant to me: my continual and desperate return towards the feet of Jesus as the day comes to a close. When I think back on this moment, and when I reread this journal entry, I feel so much peace. I feel a fair amount of nostalgia as well, because the moment was so messily perfect, but it will always be one of my fondest memories. My baptism was so special. This trip to Haiti was in it of itself short and temporary. But my baptism made it eternal. My heart breaks thinking about all the sweet innocent faces that will change into hardened, burdened souls so soon but I find a sufficient sense of peace when I think of the way my soul, and all of those children’s souls, are eternally loved, eternally safe, and eternally full. This post was originally posted on The Feet of Jesus blog here, used with permission.